James Phipps, chief executive of Swindon IT and communications group Excalibur, has been presented with the New Business Supporter of the Year Award for his commitment to Young Enterprise. 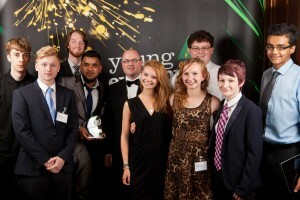 James, pictured centre back, collected the award at the Young Enterprise South West Company of the Year awards, staged recently at the University of Bristol, which were sponsored by Excalibur. James was also a judge in the Young Enterprise South West Company Programme. Guests at the ceremony were inspired and motivated by budding South West entrepreneurs who showcased their companies and told their stories of the year-long journeys they had taken into the business world. James said: “I was honoured to be asked to judge the South West finals and winning this award was a huge surprise! The reason I wanted to be involved with Young Enterprise is because it offers a unique opportunity for young people to set up and run their own real business for a year. The students are around 80 per cent more likely to find employment post-education and twice as likely to run a business as their peers. Cirencester Sixth Form College’s team Swapplications was the winner. The team aims to provide and maintain smartphone applications for schools, colleges and universities in the UK. Jeevan Thandi, iOS developer for Swapplications, said that the competition was “invaluable in developing our networking skills and also getting their business on the map outside of the education system”. Business interested in sponsorship or becoming a business advisor in the Young Enterprise scheme should contact Andrew Martin on 07816 954491 or andrew.martin@young-enterprise.org.uk.